Well, no wonder our dog barks at the doorbell! 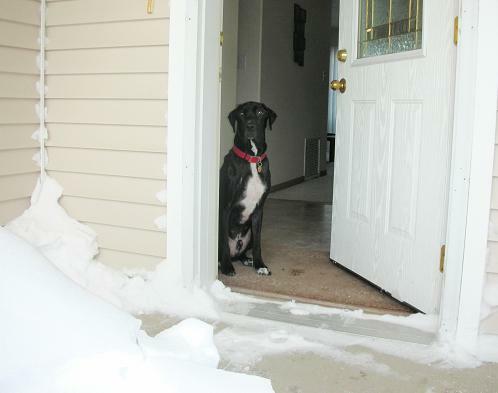 Then, when the doorbell rang yesterday, Ace stopped and turned to look at me for direction. Good boy! So … if you want your dog to do a certain behavior, you have to be consistent. Don’t do what I’ve been doing where you give direction one day and no direction the next. 1. Decide what you want your dog to do. One or two barks is OK when the doorbell rings, but nonstop barking is unnecessary. But that’s just my opinion. You know what you want your dog to do or not to do. Maybe you have a dog bed in another room you want your dog to stay on. Maybe you want her to go to her kennel. Maybe you want her to lie down. Or maybe you don’t mind if she barks, but you want her to keep all four paws on the ground. Figure out what you want her to do, rather than focusing on what you don’t want. It’s easy to begin training once you have a plan. 2. Practice this every day. Dogs need dozens or even hundreds of repetitions before a behavior is conditioned. That means I have to practice this with Ace at least several times a week. 3. Start by ringing the doorbell yourself. Do the same thing, only knock at the door loudly. Give your dog a treat when she does what you want. 5. Pretend to answer the door, even though no one is there. Make a really big deal out of it. “Hey! How’s it going!” If your dog breaks from the position, put her back. Remember to train your dog in small steps, so if this step is too challenging for her, return to an easier step so she can be successful. 6. Practice with a family member. The next step is to have an understanding friend or family member come to the door. Have them enter and re-enter the door 10 times so your dog gets lots of practice. 7. Encourage friends to ignore your dog. The hardest part about teaching a dog not to jump, bark or break a stay position at the door is most people who visit love dogs. Dog lovers naturally pet, talk to, look at and make a big deal over the dog. I do the same thing. We dog lovers even say things like, “Oh, it’s OK if he jumps. I don’t mind.” It’s very hard for a dog to stay if someone new is talking to them in an excited voice or just making a big deal about the dog in general. 8. Be consistent with this every time the doorbell rings. Dog owners tend to be pretty lenient with their dogs around other dog owners. At least I am. When my family members visit, I know they love Ace and don’t care if he gets pushy. They are even tolerant when he drools on their pants. But what does this teach my dog? It teaches him that sometimes he can get away with whatever he wants. 9. Practice at all the doors like the side door or back door. Ace goes nuts if he sees someone in our backyard. He’s usually pretty bad when someone comes to the front door, but he’s typically good at the garage door because half the time he doesn’t notice someone new came in. The point is, practice what you want your dog to do at each doorway. 10. Decide how long you want your dog to stay before you release her. I don’t have a specific length of time I want Ace to stay. It really depends on who is visiting. If a delivery person is at my door, I want Ace to stay until that person is gone. When friends are over with their dogs, I won’t expect Ace to stay for more than a few seconds. But I want him to stay until I release him no matter what. It could be five seconds, it could be 10 minutes. 11. Reinforce the stay command while guests are visiting. Sometimes it’s nice to have your dog stay in one spot for up to a half-hour when guests are over. This really teaches the dog to be calm before they can seek attention from visitors. If you have a hyper dog but she is trained well to stay on her bed for up to a half-hour, then she can still be a part of the “pack” rather than be shut away in a kennel. It’s also convenient if the dog stays on her bed while people are eating. My mutt decided to make a scene during Thanksgiving dinner and cry while he stayed on his bed. He then proceeded to cry when I put him in his kennel. This just shows that I haven’t reinforced the stay command often enough when guests are over. This is a very good thing to practice. Start with just 30 seconds or a minute at a time. 12. Keep your dog on the leash. There’s nothing wrong with keeping your dog on her leash when people come to the door or when guests are over. If it keeps her under control until she has had more training, then great. You might want to consider a short leash or “leash tab” which is a short leash your dog can wear that won’t get caught on everything, yet you can easily hold onto it if needed for control. 13. Make sure all people in your household are consistent. If you make your dog sit and stay at the front door but your kids don’t, then your dog won’t understand what she is supposed to do. Dogs need repetitions of the same behavior. Another solution is to have a really lazy dog that doesn’t care if people come over. Mine came with that feature! I also have a lazy dog that doesn’t bark and waits till people are in the house before he gets off couch. I wish he would bark. I stay alone a lot and wish to maybe warn strangers. whoa- I came to this same realization last night! You read my mind! Are you reading my mind?!?! We did pretty much all these steps for the buzzer for our apartment, and Biggie will whimper and ran to the door and let us know someone buzzed. But oddly enough he goes ballistic when he hears a traditional “ding-dong” doorbell on TV, which is NOT what our buzzer sounds like! Barking at the door is a preference thing. I think one or two barks is a good enough warning. Then the dog should let the human take care of it. I can see why some people would want their dogs to bark more. I don’t. As for Biggie, I imagine you have people in your hallway a lot! Have you tried making him lie down on his bed every time he is about to bark at people? I wonder if he does it when you are gone too or just when you are home. It takes a lot of time and commitment to teach a dog not to bark at the door… or to only bark in a limited way. 🙂 I actually don’t mind when my dogs bark at the door, I feel they are keeping me safe. The problem I have isnt Chelsea but Lucy yap yap…she goes psycho which then sets Chels off. We put her in the laundry now, then open the door…. Getting friends to ignore the Dogs when they first see them works wonders. They calm down so much quicker if they are not given a fuss each time they se them. They learn quickly that they will get attention once they are at normal energy levels. I have followed your advice and for Stella it worked out well. Thanks! I want my dogs to bark when someone knocks on my door! It means someone, most likely a stranger is on my property, and my dog’s property. My home is part of my dog’s territory, and they will bark when someone invades it. They are supposed to alert me to it. Oh, I don’t have a doorbell, so it has to be a knock, and dogs hate those! I will definitely try this for at home. my issue is in the car, if either my husband or I leave the car, or a dog is nearby, my dog goes ballistic. He even knows he shouldn’t and will stay away from us so he can continue to bark. Also, my dog is a golden retriever mix. We adopted a chihuahua/Rottweiler mix who can be very excitable. We live in an apartment building with multiple roommates, we have visitors at all hours, and he started barking at most all of them, especially in the evening. I’m gonna try these tips to teach him not to bark so much, not just for the sake of my neighbors, but for his, too. I don’t want him to be so anxious. We have lots of friends, he should be his friends, too! My dog is shepherd he’s always on protective mode and barks at anything that gets too close to our door and even outside if people gets to close. This is very useful! We have a (new) very reactive gilr who not only barks but charges while barking. We have not been able to solicit enough help to practice changing her behavior. It had not occured to use to do “fake” visits! duh! Cecily’s problem is similar to mine. My chihuahua not only barks, but also charges the visitor, even up to a sliding glass door, or if he sees a gardener or even a golfer (private golf course in back yard). Yet he doesn’t stop there – he continues barking, as in a rage, his teeth are showing (including his anxiety- releasing yawn) then he charges that person who gets too close to my mom or me (I’m my mom’s caregiver – she’s 91, and “Dale” sleeps in her lap about 75% of the day). Worse is that he has broken the skin causing a little bleeding when a sharp tooth hits a visitor’s leg, as he charges with mouth open, attempting to protect us, even from family members, and regular visitors he knows. My mom can’t really take part in the discipline, so some of her kids (my siblings) and grandkids don’t want to visit, unless I can first restrain the little guy. Anxiety and fear of those visiting GIANTS keeps me busy. Love your blog, as I am seeing plenty of good advice ! And I love the break at Solana Beach ! my son has a 3 1/2 year old cockapoo, great dog, can walk off leash, very gentle, listens well, no accidents in the house at all, unless he leaves for work or other activities. He has tried putting the dog in a smaller crate so he only has room to turn around, gives him toys, walks him, puts out to potty before he leaves, and every single time the dog pees in crate. Tried putting him in bathroom on a squishy dog bed that he loves and puts up baby gate, the dog pees. My son just doesn’t know what he can do to stop this behavior. I would love to know just where in my house, you are hiding – because every post you send seems to fit what we are experiencing with our pup at that moment. Just yesterday, my husband and I were saying that we needed to practice the doorbell ringing. We have an 8 1/2 month dobe, Julie – and I have a feeling that she and your Remy are a great deal alike! Thanks for all of the advice you have sent!! We’re trying hard……… LOL Julie is going to be a great dog, some day! Haha! So glad I can help! We have 5 dogs. Every one of them knows how to do this individually, but when they are all together mob rule takes over. Short of always having 5 friends (one per dog) to help with door greetings, any other ideas? Ha! You would think she would learn after almost choking herself a couple of times! Thanks, Lindsay, Great information I will use for Emma Lou who thinks anyone who comes over wants to play ball with her.Drive me crazy.She goes from 0 to 10 in her energy level when someone comes to the house.Back to school for us both. My dog is a powerful 45 pound terrier mix. She goes nuts jumping up to top of door and barking When anyone comes. We tried all techniques!! Nothing worked. Practiced and everything. We tried using a water gun. That worked! Oooh I should try this!! So glad it worked well for you! Halloween is a great time for her to practice tolerating those scary kids, and I give her a treat whenever she is silent for long enough to get the treat to her mouth. But I also reassure her–because it works. I tell her to heel then sit, which puts me between her and the scary kids, and in between goblin visits I let her snuggle close on the couch with me. Any advice for fearful-barking mutts? Her warning barks when someone knocks are super valuable for me because often my hearing doesn’t pick up the knock. I just want her to quit after a few barks. 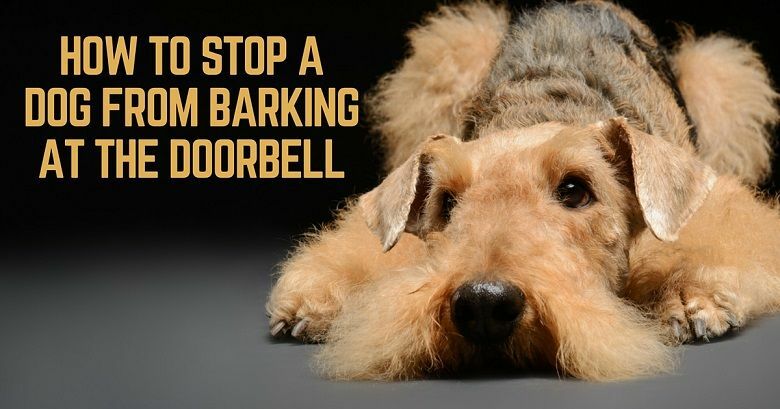 I allow my 2 dogs to bark when someone knocks or rings the bell, as well as go towards the door barking, but once I get there, I say “quiet” and they know to stop. I keep a small dish of treats nearby and use that as a distraction if needed. I taught them quiet by teaching them to “speak” then saying “quiet”, with a hand gesture. Once they stopped barking, they got a small treat.